One of the projects we had to get done before MR Hoodee headed stateside was the sample set for Future Music issue 226 - out later this month. The theme was sounds from out collection of little boxes that make noises (bleeps, bloops, squeekz, phartz ect and hardly a recognisable note in sight ;) and as we had limited space within the issue to go over what small but perfectly formed delights we used (and abused), we thought this might be a good place to into a bit of detail. We went for a mix of commercially available boxes (although some are quite limited run units) and some one-off hand made boxes made for us by some of the talented audio-alchemists we've been lucky enough to meet/bother/stalk. 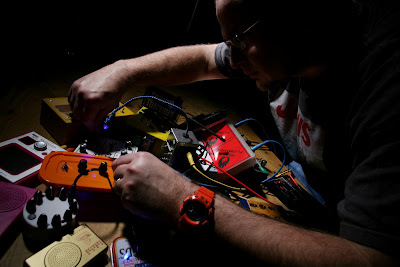 Little Japanese lo-fi mono synth that comes in a simple kit and screws together (it also ships with a fab looking Japanese synth mag). The SX-150 has a choice of eithe square or sine waveform which is triggered by running the pen along the ribbon strip. 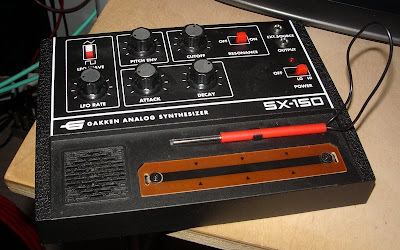 Although it's pretty limited, the Gakken can make some great noises and fx and there are plenty of hacks/mods for it online.